For the 6th consecutive year, young people and youth leaders ages 15-21, along with adult allies from across South Los Angeles, will come together for a day of teen-led workshops, interactive games, musical performances and other activities to promote health and well-being on Thursday, March 29 at Holman Community Center, 3320 W. Adams Blvd., in Los Angeles. “Spring into Love” helps support young people’s abilities to take more control and make informed decisions about their sexual and reproductive health. The event includes a resource fair that connects participants to organizations across Los Angeles to help support ongoing healthy decision-making. This year’s event will focus on health topics related to healthy relationships, social media and self-esteem, and HIV, sexually transmitted diseases (STDs) and pregnancy prevention, while addressing the reproductive and sexual health disparities that dramatically affect young people of color in the South Los Angeles community. 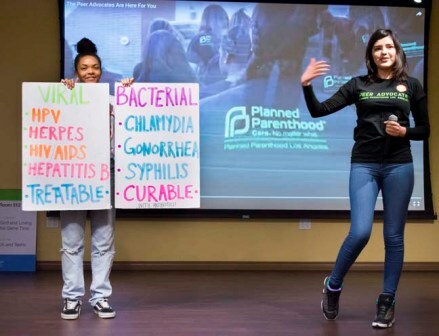 According to the Los Angeles County Department of Public Health, data from 2015 show that African American women between the ages of 15 and 24 in South L.A. have seven times higher gonorrhea cases and 3.3 times higher chlamydia cases than White women. “I love ‘Spring into Love’ because it’s an event that makes everyone feel included. Plus with all the various groups who show up, I love knowing there a lot of different resources available to help,” said Kat Mancia, Augustus Hawkins High School alumna. “Spring into Love” is a collaborative effort between various community-based organizations and coalitions including Black Women for Wellness, Connect to Protect Los Angeles (C2PLA), Essential Access Health, Planned Parenthood Los Angeles, L.A. County Department of Public Health, The L.A. Trust for Children’s Health, St. John’s Well Child and Family Center, UMMA Community Clinic, WeCanStopSTDsLA and Coachman Moore and Associates, Inc.
For more information, call (323) 745-2470.